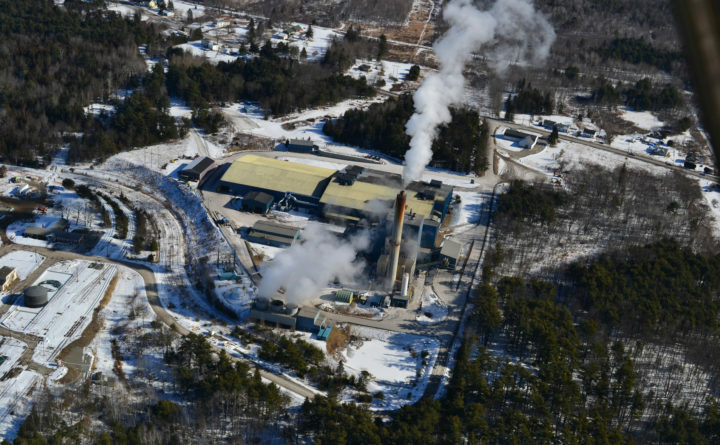 Aerial file photo of the PERC plant in Orrington. The Penobscot Energy Recovery Co. has laid off more than 20 percent of its workforce, due in part to losing contracts with communities that chose to send waste to a new facility that likely won’t be fully operational until the end of the year. On April 9, PERC laid off 17 of its 75 employees, Plant Manager Hank Lang confirmed. The layoffs came eight days after PERC lost close to 130 of its community contracts, Lang said, most of which are members of the Municipal Review Committee, a collection of nearly 200 towns and cities in central, northern and Down East Maine dedicated to environmentally friendly means of disposing solid waste. In 2016, those MRC member communities ended their contracts with PERC in order to work with its competitor, Fiberight, which is building a 144,000-square-foot waste processing and recycling facility off Coldbrook Road in Hampden. Fiberight will allow communities to process organic waste into biofuel, and leftover fibrous material will be used to make fuel pellets for heating. Construction on the Fiberight facility began last July and it had been set to open April 1. PERC’s contracts with dozens of communities expired on March 31, with the expectation that Fiberight would be able to take over on April 1, but the $69 million facility is still months from completion. Because Fiberight likely will not be fully functioning until the end of the year, in the meantime the solid waste that was formerly processed at PERC is being sent to landfills. PERC is a sprawling waste-to-electricity operation located on 42 acres in Orrington. It’s capable of processing more than 300,000 tons of municipal solid waste every year. Lang, who has worked at PERC since it opened in 1988, said the layoffs are the first in the company’s history, but the decision has been in the works for awhile. Last year was a banner year for PERC, which processed 315,000 tons of waste — the most in its 30-year history, Lang said, adding that MRC communities alone contributed more than 200,000 tons. As of April 1, the remaining 35 to 40 communities that chose to stay with PERC account for only 32,000 tons of waste. While PERC still holds separate contracts with commercial haulers, the overall dramatic decrease in tonnage, coupled with the purchase of newer, more efficient machinery that requires fewer people to operate, led to the layoffs, Lang said. In late January, the MRC board voted to temporarily send up to 62,000 tons of waste to PERC until the Fiberight facility was ready, but Waste Management Corp., which owns and operates the Crossroads Landfill in Norridgewock, wanted exclusive rights to dispose of the waste, and therefore would not allow a portion of it to be diverted to PERC, MRC Executive Director Greg Lounder said. Half of MRC’s waste is being landfilled at Crossroads and the other half at Juniper Ridge Landfill in Old Town, Lounder said. Separately, on March 31, Casella Waste Management, which operates state-owned Juniper Ridge, was granted permission by the Department of Environmental Protection to dump MRC waste at the site for at another year, with the possibility of a six-month extension after that.